Fr. Konstantinos E. Kostakis is Assistant Professor of Ecclesiastical History. He graduated from the Department of Theology of the Aristotle University of Thessaloniki (1984) and the Pedagogical Academy of Heraklion (1979). He did postgraduate studies in the Historical Theology (1984-1986) and holds a first PhD in Ecclesiastical History from the Aristotle University of Thessaloniki (1995) and a second PhD in the cognitive field of the History of Greek Education from the same University (2009). He has a teaching academic experience, as a teacher at the Democritus University of Thrace (Art. 5 P.D. 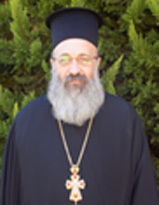 407/1980) for a four-year period (2001-2005), as Visiting Professor at the University of Balamand St. John of Damascus Institute of Theology (Decision 7327/13 / ΑΣ 312 – 25/05/2005 Ministry of Foreign Affairs of Greece), as Visiting Professor at Neapolis University of Pafos (2013-2017) and responsible and rapporteur of Training Programs at the Regional Educational Center of Alexandroupolis (1995-1999).